Farmgirl Fare: Can You Tell What This Is? Four more photo hints will be posted throughout the day. Interesting guesses all (especially the 'bored water-trough fairies' idea--love it). The black thing is a 100-gallon Rubbermaid stock tank (that holds water for large livestock), but it is turned upside down. It is sitting in the grass, totally out in the open, nothing is overhead, and nothing was sitting on top of it or anywhere near it. This is also where and when this leaf photo was taken. It looks like some sort of ice eruption ... how incredibly cool! Been reading your blog a while, just posted a link to it on mine. Haven't tried any of your recipes yet, but that lentil & sausage stew is calling my name. Love your photos, as well! I'm of the opinion that New England is the prettiest section of the country (having lived in them all), but I must say, your photos make the midwest look beautiful! Off topic - love the whimsical new banner (or it might not be SO new, I usually read via RSS) but where are the llamas? How cool! 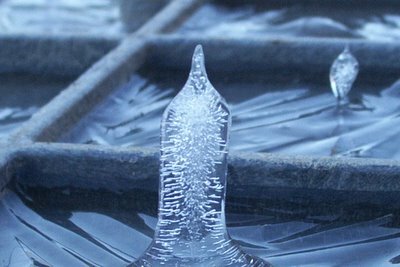 I'm thinking ice stalagmites, too. How cold is it there now? It's in the 20's at night here, and the wind is blowing with all its might tonight! I've missed you, just got the old computer up and running, and hope you are well and warm! hmmm. 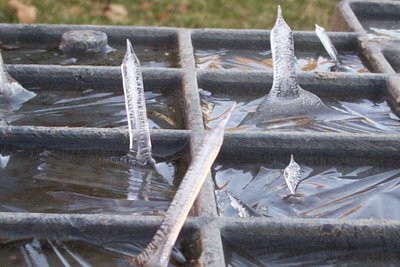 some kind of fairy popsicle created by bored water-trough fairies? I like the ice stalagmite suggestion too...although wind would seem to be a logical explanation. That or a branch that fell into the trough? Although with the guard on top, that seems the least likely...no, I definitely think it was the water trough fairies making popsicles. stalagmite.. but how.. maybe those llamas did that. 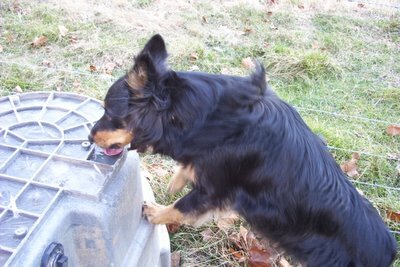 I'd say that something that's at least 4-5 inches tall and has holes was sitting on top of the (water bowl for a very thirsty puppy?) thing with the icemites sticking out of it. 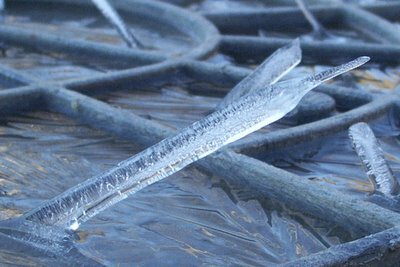 Then it rained and froze, afer which you removed the holey thing, leaving the icemites and some very cool pictures. It's either that or anti-gravity snot from Gollum, hidden under the ice. I go with emma - water trough fairies!! 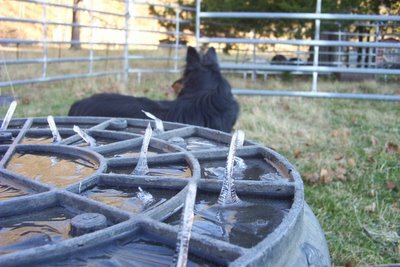 Hmm think it's a sheepsie drinking fountain with several little sprinkling thingies to quench their thirst, and you forgot to turn it off for the night and hey presto icemites! As a former farmgirl who grew up in Minnesota, I can say that cold+wind+water can result in some amazing formations. Water can indeed freeze in the blink of an eye - a frozen waterfall is an amazing sight. I love the "upsicle" word, and the thought of fairy popsicles is so cool...love your blog, keep it up! Wow. It's so cold and wet that the wind is blowing out upside down icicles...because the water freezes instantly...hmm. I don't think Missouri is the place for me!Reminds me of that movie, The Day After Tomorrow! Those are some of the most interesting ice formations I've ever seen. Here's a scientific explanation for how this happens. Not as fun as water-trough fairies or Gollum-snot, but science is fun too! forms on same. compounded by temp. variations (uneven cooling rates)from water caught in the w tank sections & tank.